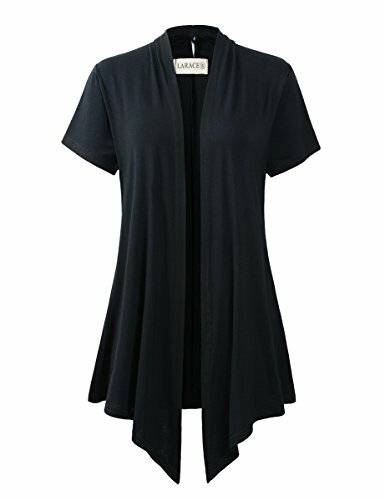 Never to miss this fashion women's cardigan in summer! Chic soft draped fabric with open front enables you to show off your waistline and get tummy control effect visually. Pair it with tank or T-shirt to get classic and cute look. Great gift for women, juniors, ladies and teen girls. Please compare your size detail with our size chart as below to choose the perfect size. 1. There is 2-3cm difference because of manual measurement. 2. As different computers display colors differently, the color of the actual item may vary slightly from the above images, hope you can understand. Material: Premium quality fabric, lightweight and breathable with slightly stretch. Features: Short Sleeve / Open Front Draped / Slim Fit / Irregular Hem. Plus size cardigans available. Design: Draped cardigan comes with A-line effect, hides your tummy and creates flattering look. Occasions: Home, Office, Party, Club, School, Casual for Spring, Summer and Fall. Perfect for Women, Ladies, Juniors, Teen Girls.